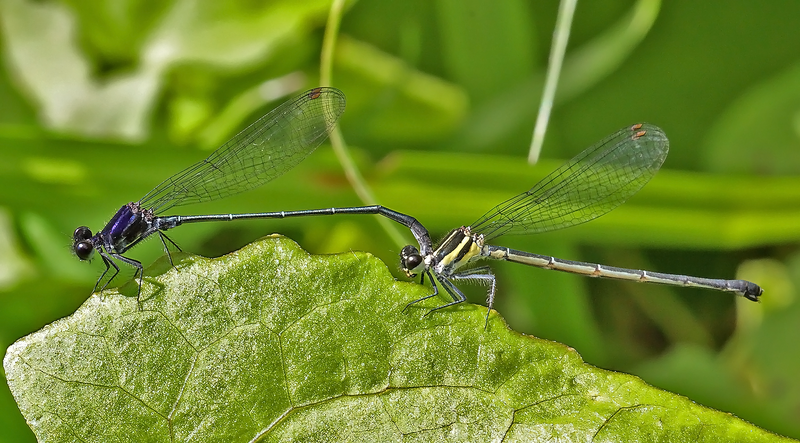 Onychargia atrocyana is a very widely distributed damselfly species. It is distributed throughout South-East Asia, India and China. In Singapore, this species is uncommon and found mainly in densely vegetated and leafy-bottomed pools, marshes in swampy forested areas. 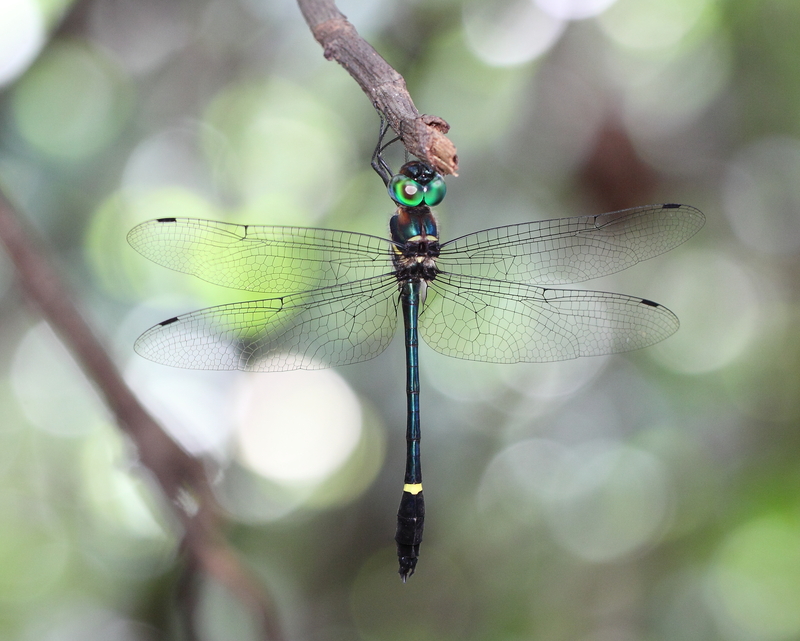 I have personally come across this species at Chestnut avenue biking trail and the densely forested area in Mandai. As this species breeds in leafy pools and marshes, it is often seen mating in tandem in these habitats. 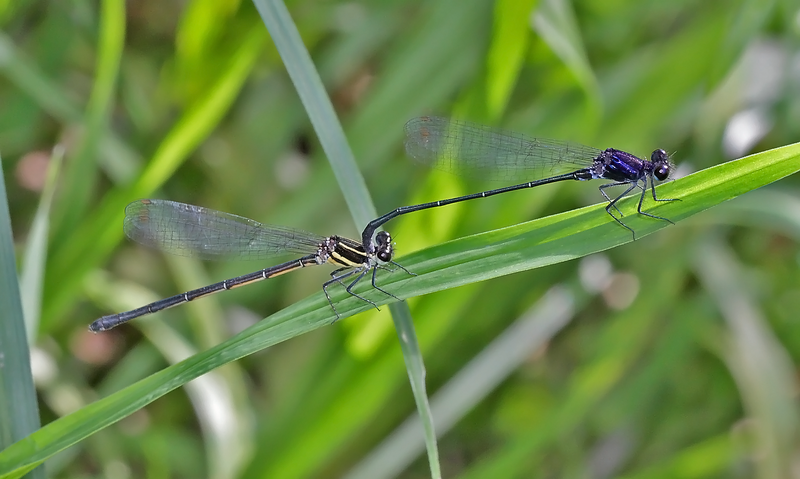 Both males and females are stoutly built with short abdomen and long legs. 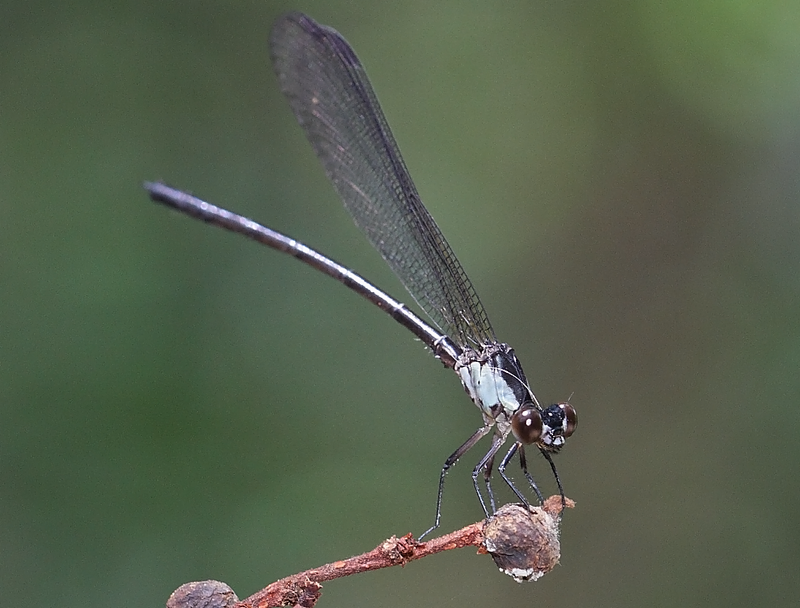 Older males are blackish with hues of purple on the thorax. 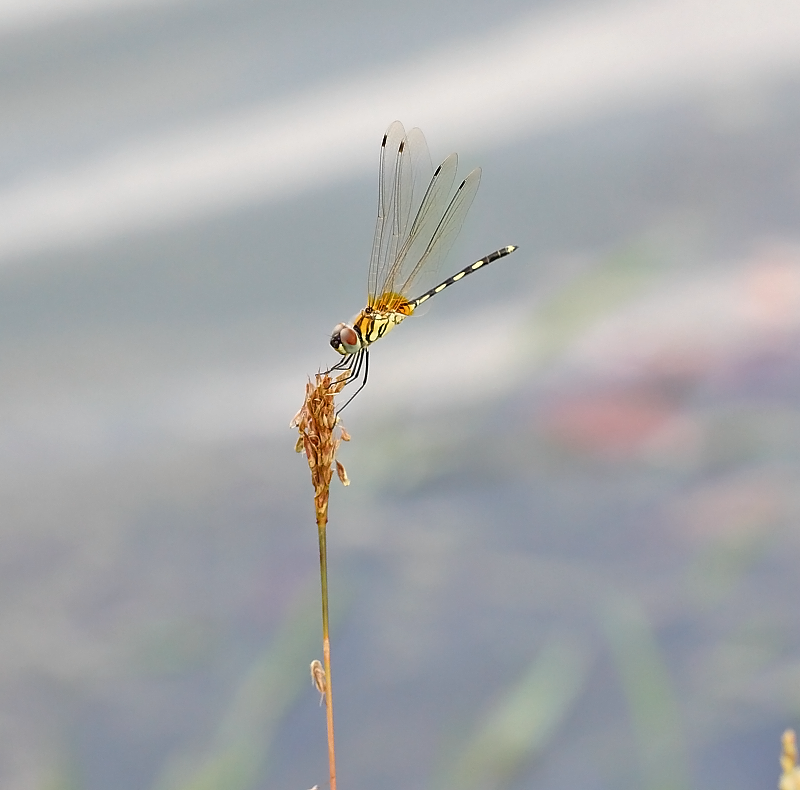 Young males have thick light yellowish stripes on the sides of the thorax. 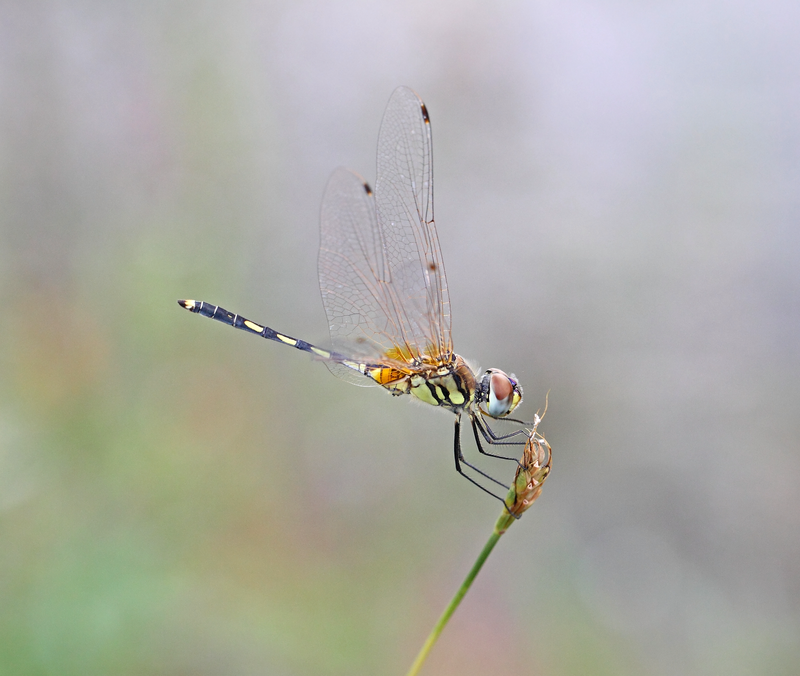 Females thorax are also dark with two yellowish stripes on the dorsum. The abdomen is dark on the dorsal side and yellowish on the ventral side. A pair in copula (1) taken at Chestnut forest. A second pair taken at a stream near Zhenghua Park. Third pair taken at a forest at Mandai. Another shot of the third pair. 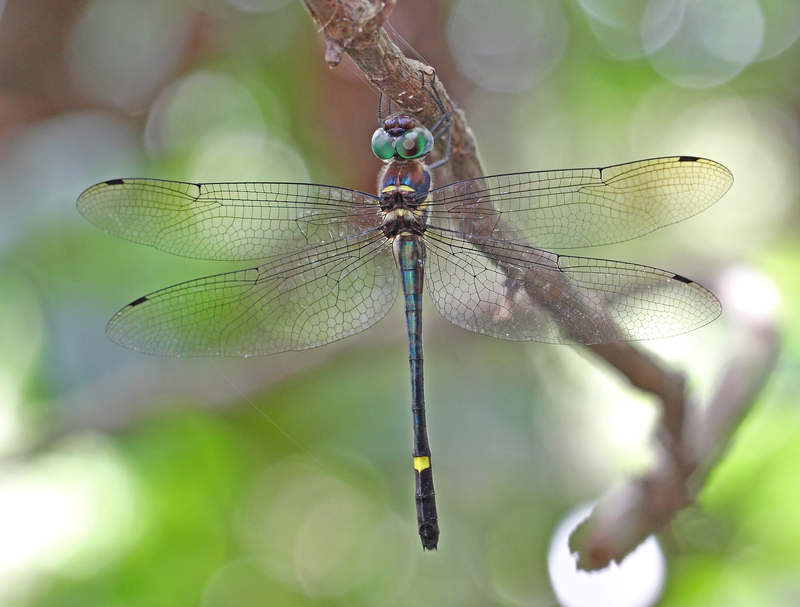 This elegant dragonfly is a migratory species and uncommon in Singapore. 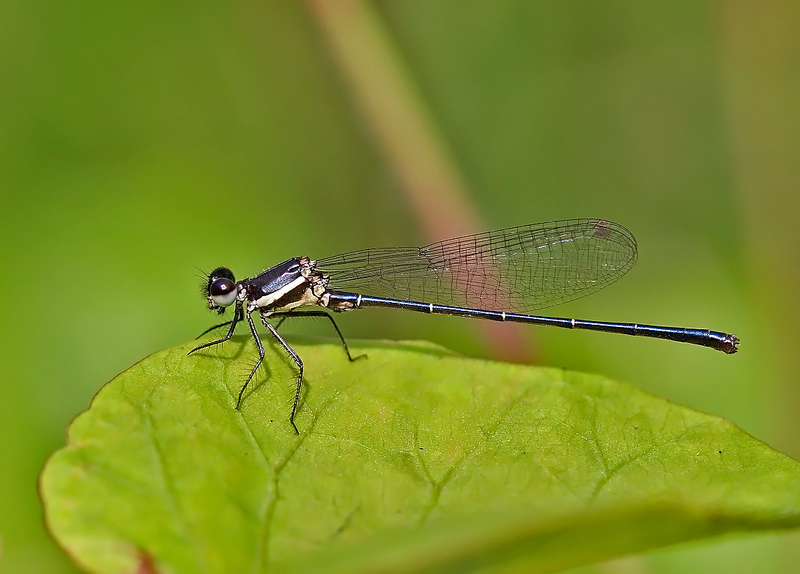 It can be found in open grasslands and coastal regions of the reservoirs. 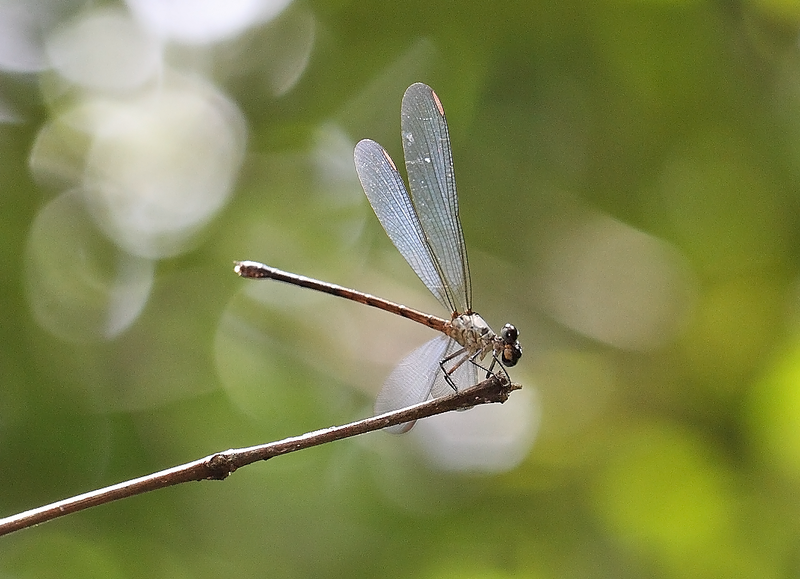 I have come across this species at MacRitchie Reservoir, Upper Seletar Reservoir, Upper Pierce Reservoir and other large water bodies habitats. 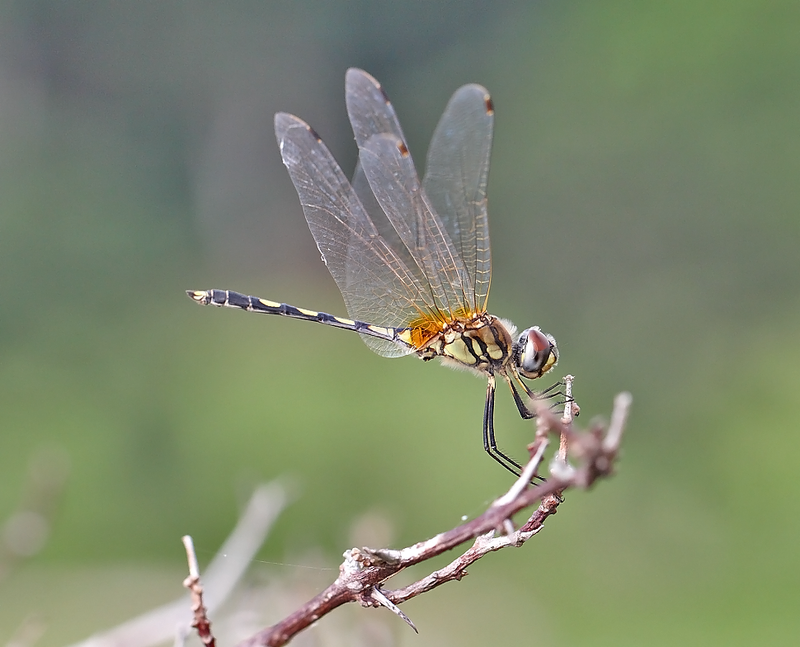 This species is recognised by it’s light coloured wing-veins and the well-defined yellowish markings on the thorax and abdomen. 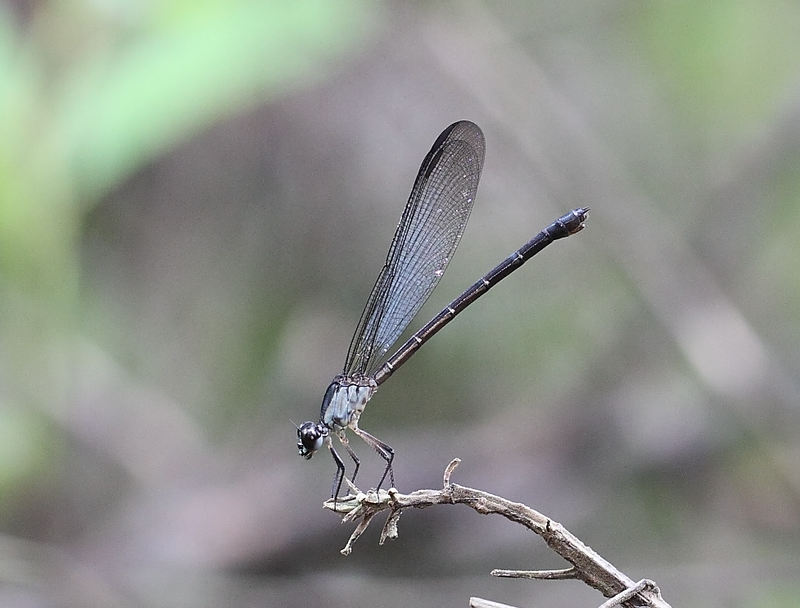 It’s wing base is tinted with amber-brown and the legs are long and slender. Females are similar in appearance. 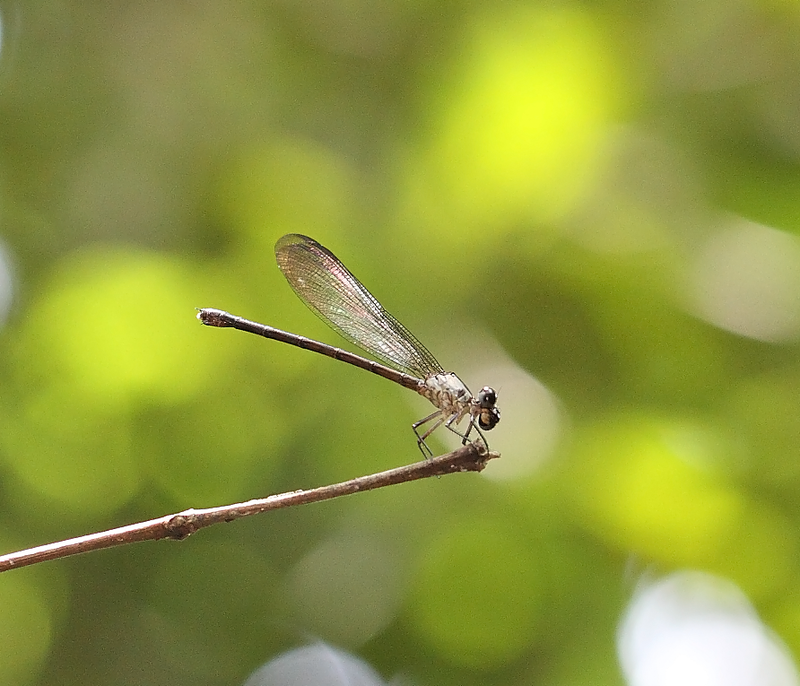 This one taken at MacRitchie Reservoir. 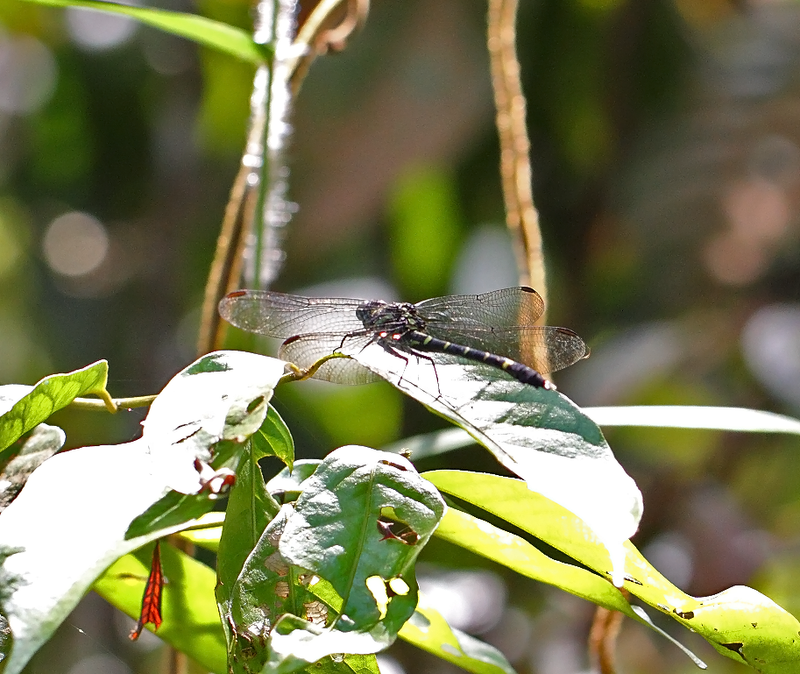 Another male at MacRitchie Reservoir. A female, very similar in appearance. 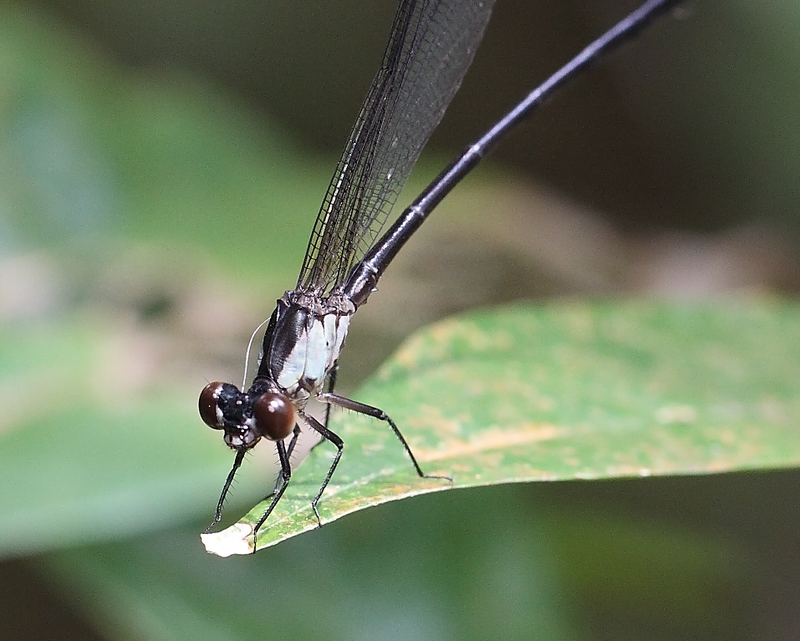 This species is very rare in Singapore and was first recorded in Nee Soon Swamp Forest in 2007 and 2008. 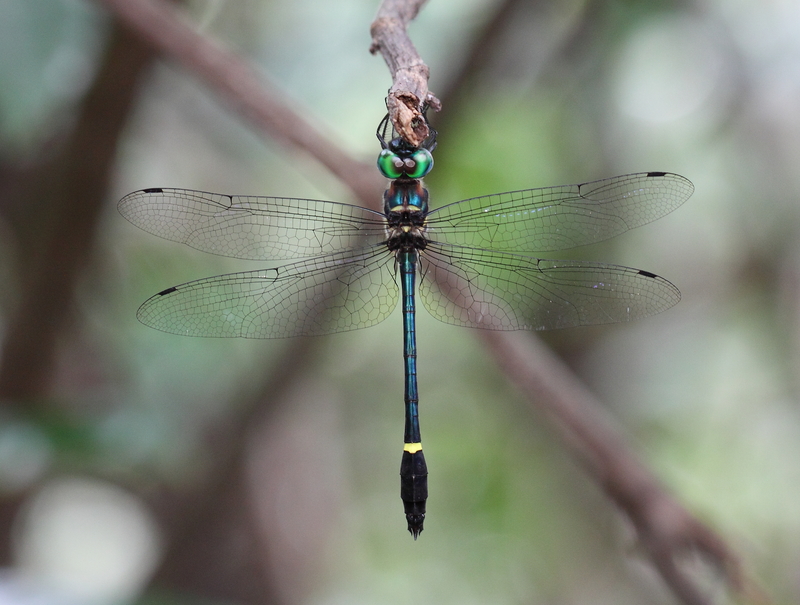 There was a single male specimen recorded from Peninsular Malaysia on 1921. 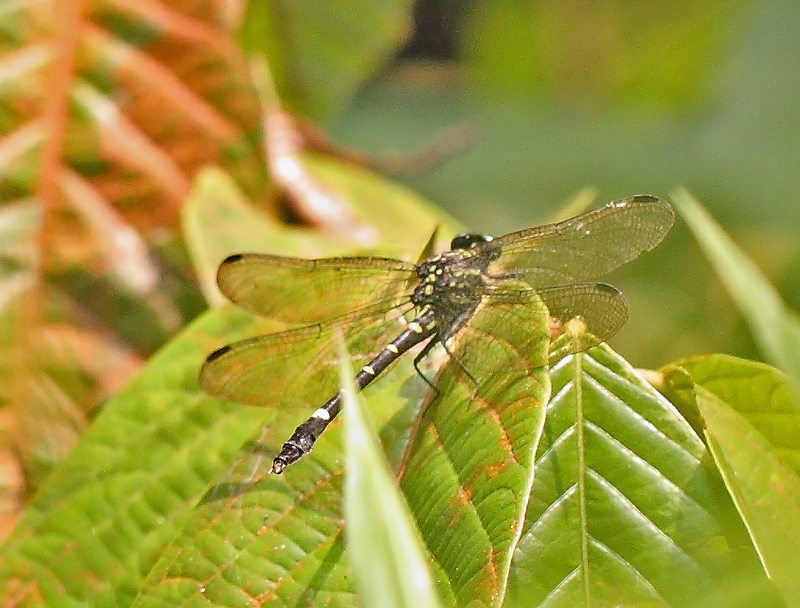 I found the female individual at a heavily shaded forest trial at NSSF in Jun 2013. It was found resting on a fallen tree trunk on the trail when I first seen it. 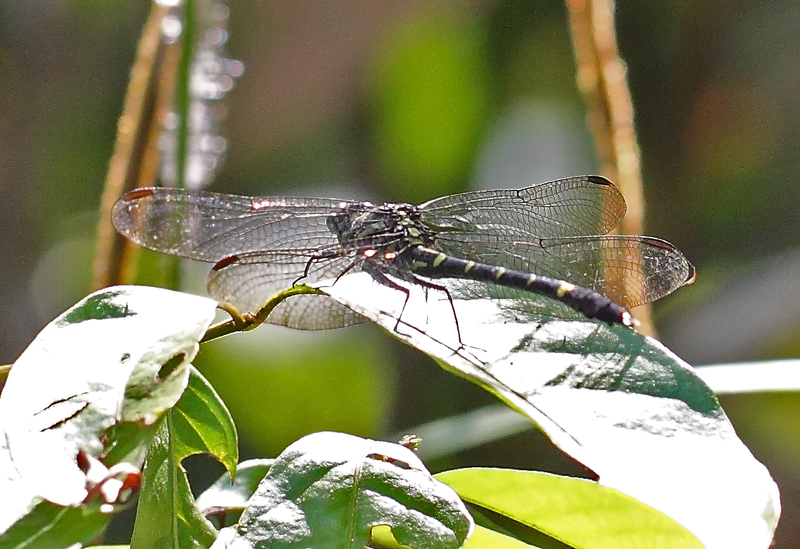 Shortly afterwards, it flew and rested on top of a leaf slightly above my eye level and facing away from my view. I managed to took a few quick shots before it flew even more higher up to the canopy and disappeared soon after. This is a medium-sized gomphid with well-separated green eyes. It has greenish yellow stripes on the sides of the thorax. 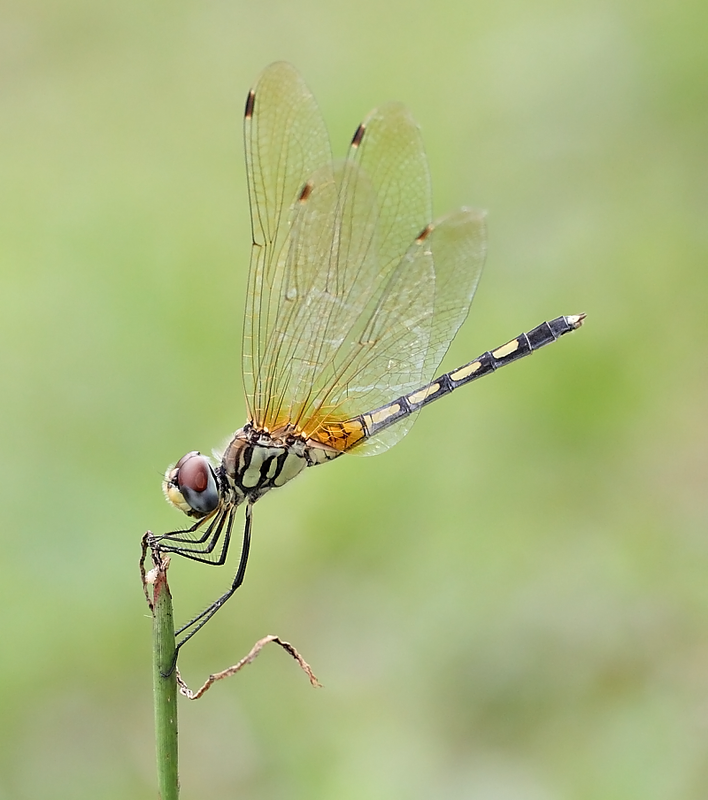 The abdomen segment has five horizontal yellowish stripes. Another distinguishing feature is the white superior appendages and the long hing legs. The female Merogompus femoralis found at the forest trail at NSSF. An enlarge cropped, showing the well-separated green-eyes and long femur legs. 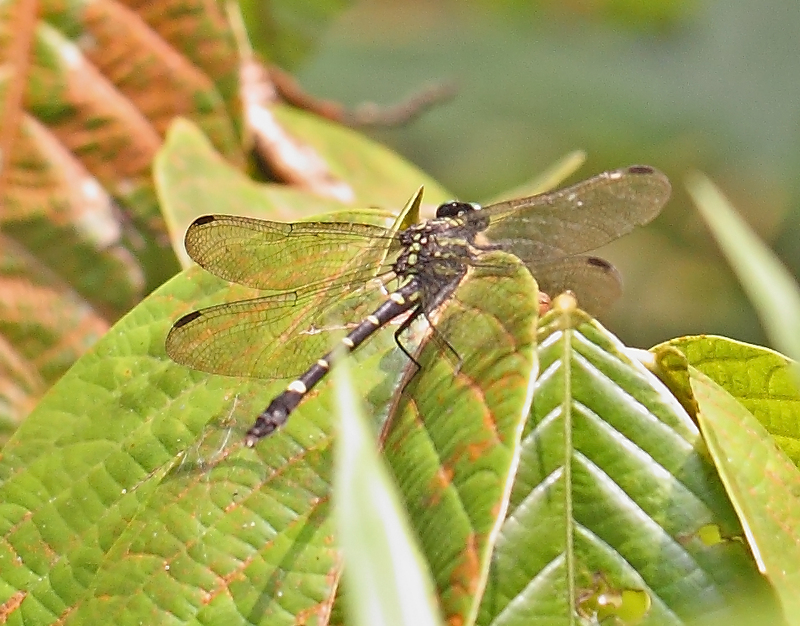 The five yellowish stripes on the abdomen can also been seen. About a week later when I was at the exact spot where I seen the first female, I saw another individual (or was it the same female? ), resting on the same tree. This individual was also very skittish and does not allowed me to take more than a few shots. Not sure if this is the same individual as the first female? Or was it a male? I am very sure they are of the same species. Although not very clear from this photo, the long, curved inwards, and whitish superior appendages can still been seen. I have compared the photos of these two individuals with the one published by Mr. Tang and found it to be very similar. My conclusion of this species is that it is very skittish, and it could well be found deep in the Singapore forests. 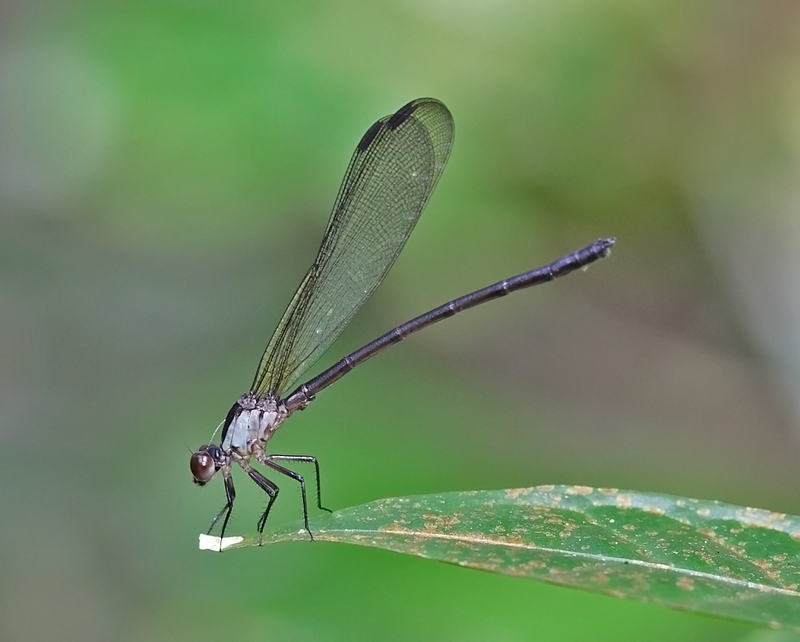 Euphaea impar with hyaline wing has been observed very few times in Singapore. 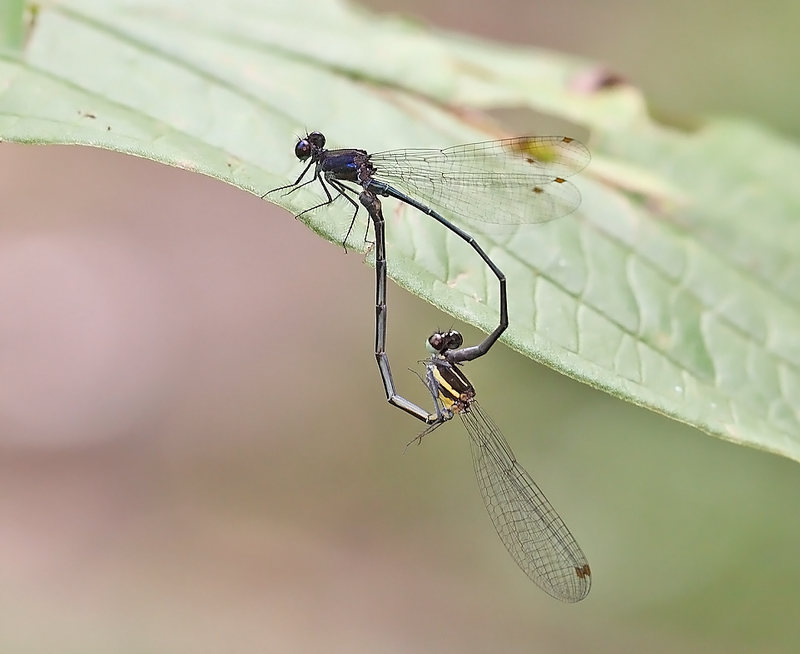 Recently I came across both male and female form in the Central Catchment Nature Reserve. Female resting on a branch from a very high perch. 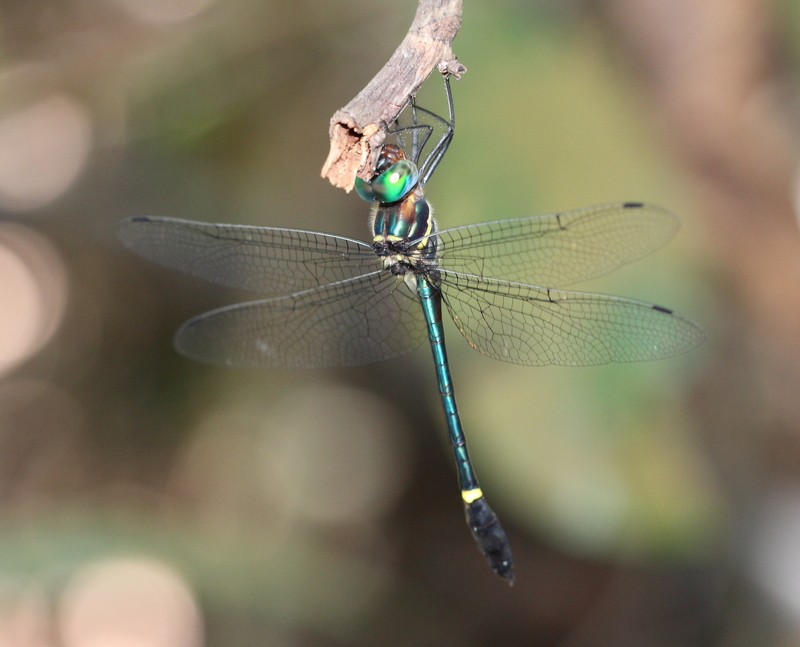 Same female with her wings closed. Same female at a lower perch. 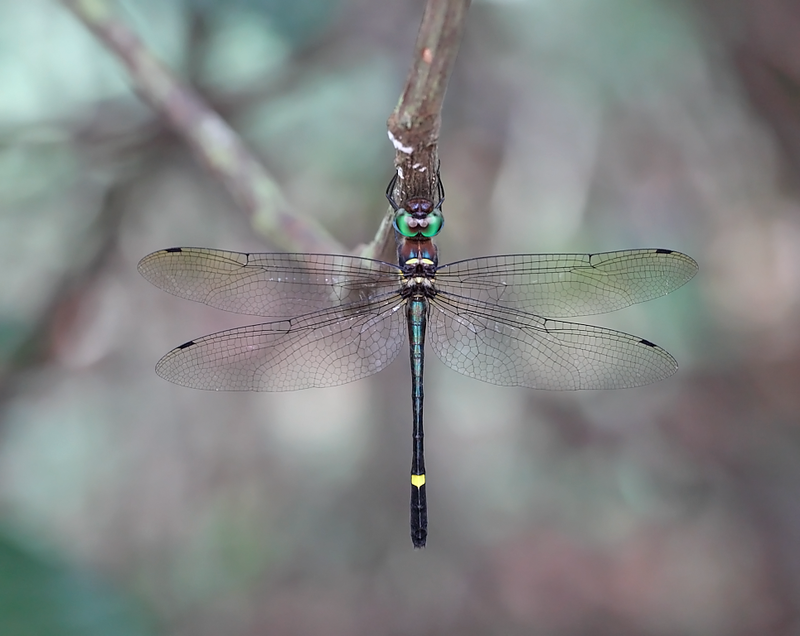 Macromia cydippe is very rare in Singapore. My sighting of this species is mainly concentrated at the Central Catchment Nature Reserve. 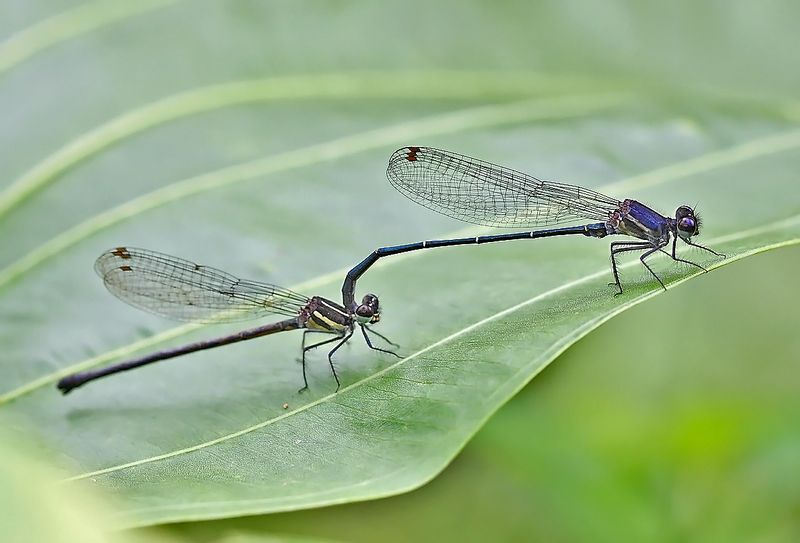 Here is the male and female taken at the MacRitchie Reservoir. 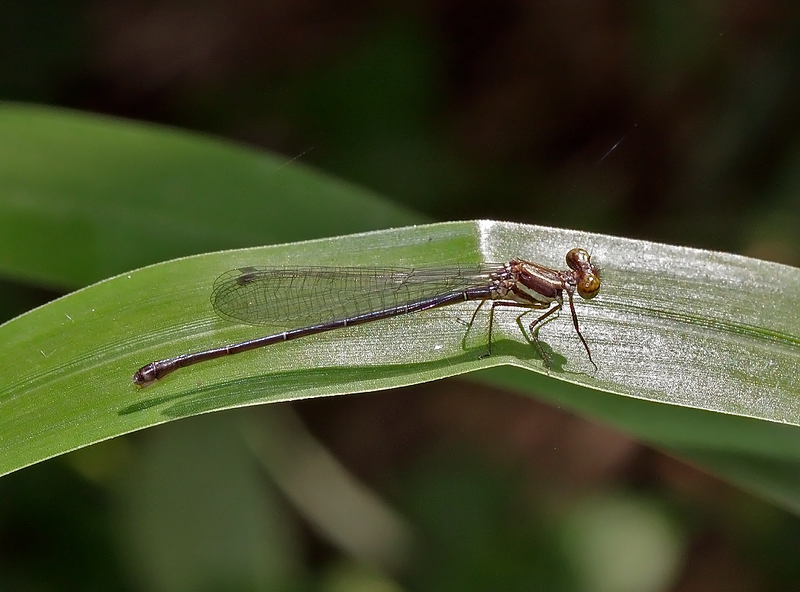 Female lesser stream cruiser. Notice the prominent white spot at the base of 7th segment of the abdomen. Female is slightly more robust than the male.